Description: Are you sick and tired of being alone? Bored on the weekends? Looking for a companion to spend time with you on the South African beaches? If so then this website is for you. 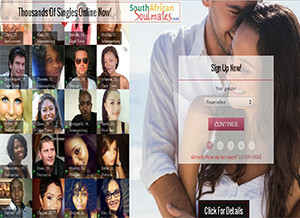 SouthAfricanSoulmates.co.za has thousands of members who are ready for dating in South Africa. Ready to have romance, friendship and fun and some are even looking for long term relations. Joining this website is completely free and after you join the site, you can easily make your profile page with your photo and descriptions and start dating. Contacting people of your interest is fun and you would love doing it. There is also search option by which you can easily find people depending on the geographic locations. There are more detailed search options like finding people by postcode, age, interest, marital status, smoking habits and other. In member’s area you will be able to see who has visited your profile and from your personal inbox you can manage all the sent and received winks. Special facilities are offered to the premium members such as adding video profiles and managing your dating diary. This allows other members to know you in detail and enhances contact from other members. If you become a premium member then you will have access to special services; like sending an instant message to other online members of your interest, making a video profile, doing video chat and much more. To become a premium member you have to pay the monthly fee of R 95 and it can be done through the My Account area. If you wish to take full advantage of the site for dating and want to have a great online dating experience then you must become a premium member. There are other interesting compatibility findings things as well like checking for star sign compatibility and personality tests. Ease of use: The navigation of the website is very easy and all the areas have been mentioned clearly. If you feel some difficulty and need help then you can easily contact them through the contact support via email and telephone. You can search for users according to areas of your interest and location. Overall it is a site well worth visiting. Selection of profiles: The website has profiles of more than 2 million users and finding the person of your interest is just a click away and even video profiles are available. Many new profiles are added each day and you can search for profiles based on age, gender, interests, location and habits. Star rating: The site is great for anyone looking for love in South Africa and can be rated 5/5. The services it provides are really useful and user friendly. The site has been in business for quite some time now and is run by a UK based company named Global Personals Limited which is specialized in the online dating field. Contact Details: Online support ticket is available for registered users. You can reach them 24/7 through this service.